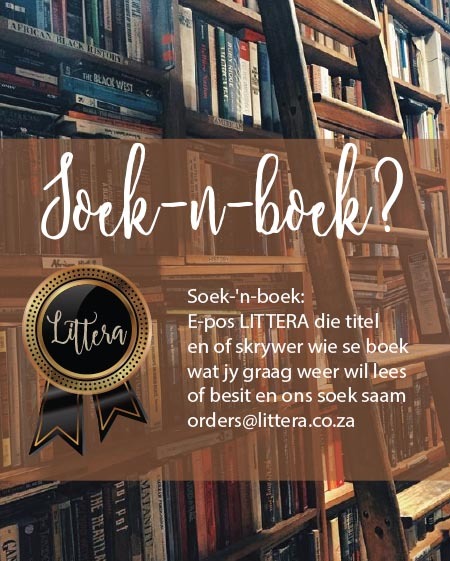 www.littera.co.za (the “Website”) is owned and operated by Hickey Communications CC t/a LITTERA, registration number: 2007/232996/23 (hereinafter referred to as “Littera”). Placing a product in a shopping basket or adding it to a wishlist without completing the purchase cycle does not constitute an agreement of sale and/or an order for such product, and as such, Littera may remove such product from the shopping basket or wishlist if stock becomes unavailable and you cannot hold Littera liable if such product is not available when the purchase cycle is completed at a later stage. Littera reserves the right, for purposes of preventing suspected fraud, to blacklist you on its database to refuse to accept or process payment on any order, and/or to cancel any sale concluded between you and Littera, in whole or in part, on notice to you. Littera shall only be liable to refund monies already paid by you, and accepts no other liability which may arise as a result of such blacklisting and/or refusal to process any order/sale. 1. Prices: The price of each product is displayed with the product listing. In the event of a sale or special offer, the discounted price is displayed. 2. Delivery Charges: Delivery charges differ depending on a variety of factors, including product type, price, and weight, as well as whether delivery is to be made within, or outside, the borders of South Africa. 3. Value Added Tax: Value added tax at the rate of 14% is charged on goods bought by South African residents. VAT is not payable on orders if both the billing and the shipping address are international. 4. Import Duties: Import duties may be payable by recipients of goods in foreign countries. Littera does not know what import duties/levies may be payable and cannot calculate or estimate such costs. You are responsible for determining whether any such import duties/levies are payable and, if so, the amount thereof. Errors: Littera shall take all reasonable efforts to accurately indicate prices and delivery charges. However, should products be erroneously offered at incorrect prices and/or delivery charges, Littera will not be obliged to sell products at such incorrect prices and/or delivery charges, but shall refund monies paid by you should you not wish to proceed with the purchase at the correct price and/or delivery charge. At the time of placing the order, the transaction details are presented to the bank and payment is collected immediately. If the bank’s authorisation is not obtained, the order will be cancelled. Littera may carry out certain fraud checks with the cardholder or the cardholder’s bank, should Littera be unable to verify the validity of the transaction the order will be cancelled. Delivery charges are calculated automatically based on the delivery destination, total value, weight and dimensions of all products included in an order, when the order is created. Please read our Delivery Charges page for further details. South African Post Office: You can choose to collect your parcel from the Speed Services counter at your local Post Office. NOTE: Only media products (namely Books, CDs, DVDs) can be delivered to post offices. NOTE: If your parcel weighs 10kg or more (but less than 30kg), a surcharge applies. If your parcel weighs 30kg or more, you will have to arrange with LIttera for collection. NOTE: Only media products (namely Books, CDs, DVDs) can be delivered internationally, provided that your parcel weighs less than 10kg, and is no bigger than 120cm in length, breadth or height. All international deliveries are subject to the import and custom laws of that country, and Littera cannot be held responsible if a parcel or item is detained or confiscated due to these laws. Delivery usually takes place within 2 or 3 weeks after dispatch, however, seasonal peaks and delays at customs is outside the control of Littera and deliveries may take up to 12 weeks. Physical Vouchers can be purchased and will be delivered in the same way that Littera products are, either on their own or together with other products. Payment for the electronic Voucher/s will also be obtained from the bank immediately. This Website is managed and owned from the Republic of South Africa and therefore governed by South African law and, subject to the ‘Disputes’ clause of these T&C, you and Littera submit to the non-exclusive jurisdiction of the South African courts. Any person that delivers or attempts to deliver any damaging code to this Website or attempts to gain unauthorised access to any page on this Website shall be prosecuted and civil damages shall be claimed in the event that Littera suffers any damage or loss. You allow Littera to take all reasonable steps to ensure the integrity and security of the Website and back-office applications. All credit card transactions are Secure Socket Layers encrypted. Littera’s registration documents and the Website’s registered domain name are checked and verified by Thawte. Littera may, in its sole discretion, change these T&C or any part thereof at any time on notice to you. It is your responsibility to ensure that you are satisfied with the amendments. Should you not be satisfied with the amendments, you must refrain from placing any further orders on, or from using in any way, the Website. When you visit the Website or send e-mails to Littera, you consent to receiving communications from Littera electronically and agree that all agreements, notices, disclosures and other communications sent by Littera satisfy any legal requirements, including but not limited to the requirement that such communications should be “in writing”.